The ephemeral user to help you to login WordPress. 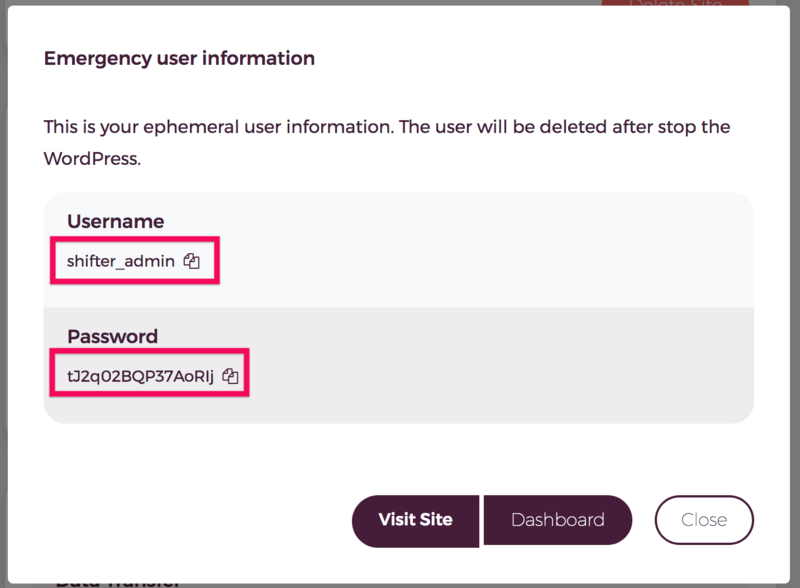 An emergency user is an ephemeral user who has administrator role and enables you to login WordPress if you cannot log in with current username and password. Users belong to the Organization also can create this ephemeral user. Forget username, password or email address. Cannot reset a password with email because of wrong address has been set. Cannot log in after migration. Locked out from the WordPress dashboard. 1. Navigate to [Site settings] of your site to launch. 2. Scroll down to [Emergency Actions] section, then click [Launch WordPress with emergency user]. 3. Copy username and password then login to WordPress with them. If you have missed copying temporary account information, stop WordPress and re-launch to get a new one.